Trade across all major futures markets! Interest Rates from major Exchanges across the Globe. Customisable cost of trading tailored to your activities. Long or Short, Sell or Buy first in any order for any of the above futures products. Only a fraction of asset value in terms of margin is required to establish a position e.g., SGX SiMSCI Futures require an initial margin that is about 5% of the contract value. In other words, it offers about 20 times leverage. 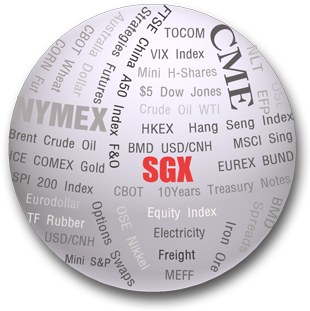 Includes currencies, gold, equities, energies and interest-rate futures. Trade in major global markets on our robust internet trading platform. Losses are not limited to what you have deposited for margin. You can lose more than your initial deposit. High degree of leverage can work for you as well as against you. While a small change in the underlying asset’s price can translate into 20 times magnification in profits, it could also translate into 20 times magnification in losses if your view turned out to be wrong. If the market moves against your position or margin levels are increased, you may be called upon to deposit substantial additional funds on short notice in order to maintain your position. If you fail to comply within the specified time, your position may be liquidated at a loss and you will be liable for any resulting deficit in your account. During extreme market movements, your positions may be liquidated if the equity balance falls below 30% of the initial margin requirements of all your positions. During adverse market conditions, your best efforts in limiting your losses with the use of “stop loss orders” may not be effective because market conditions may make it difficult or impossible to execute such protective orders. Trade futures online or with a broker.